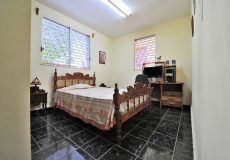 Rooms in a beautiful house of 80 m2 in the Panamerican Village, East Havana. The rooms have air conditioning and 1 double bed. 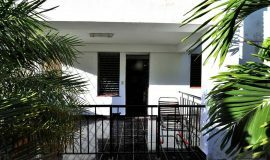 We rent 2 rooms in a beautiful house of 80 m2 in the Panamerican Village, East Havana. The rooms have air conditioning and 1 double bed. The house has garden, portal, carpoch to park, large dining room, interior and exterior backyard. We offer breakfast service (2 cuc), lunch and dinner (5 cuc), although guests can cook and store their products in the fridge. We provide towels, sheets and cleaning service 3 times a week. The bathroom has hot water and is shared with a person who lives in the house. We offer laundry for personal clothing for free. The house is ideal to rest because we have a beautiful gauntry, garden and a backyard with mangos and bananas trees. Also, the house is plenty of light, very quiet and clean. We are available to advice about all kind of interesting and touristic places in our city, and offer breakfast, lunch and dinner. We are located just blocks away from several super markets and fruit/vegetable vendors. We have staff on call at all times that are here to help with all your needs such as travel advice and finding taxi drivers. We get great pleasure in giving our guests the best authentic Cuban experience and meeting new long lasting friends. We hope to see you soon! The Panamerican Village is a small, quiet, and clean neighborhood, located near to Cojimar and East beaches of Havana. The house near to the famous neighborhood of Cojimar which is where Ernest Hemingway’s legendary Nobel Prize Winning novel, “The Old Man and the Sea” is set. Cojimar is just a quick 10 minute ride from downtown Havana, and there are several buses that take you to your desired destinations in Old Havana or Central Havana. We are also situated just 15 minutes from the famous Eastern Beaches of Havana that are also easy to get to via taxi or bus. Our home offers a taste of both worlds for those who are looking to explore Old Havana’s historical colonial streets, or spend your days soaking up that beautiful Cuban sun on a soft sandy beach, then to return home to enjoy a meal at one of Ernest Hemingway’s favorite hang-outs: La Terraza, located just blocks away.